I posted a few more pictures (click on the one shown), including some of the bluebottle jellyfish that invaded the beach on Wednesday; the second wave showed up yesterday. Last night I walked down to the beach to relax a bit -- it was a nice cooler evening and the sun was slowly drooping behind me as I gazed out at the surf. 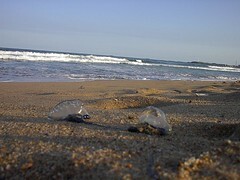 A fresh deployment of jellyfish lay on the beach in a sort of rescue mission for their cohorts who had washed ashore the day before. They haven't learned to walk yet, so the mission was not much of a success. Although most of their kind lay too far ashore, some of them retreated back with the waves. The beach activity for the day had been minimal, perhaps because of the blueys lining the beach. Instead of deep footprints from scantily-clad bronzed aussies, seagull tracks showed the whole day had been spent in squabbles over who-knows-what. Some secret sea-floor mischief lay about 200 meters from the shore, causing the waves to argue amongst themselves. A particularly strong wave recedes at the same time a strong one approaches -- butting head to head they erupt high into the air, much like lava from a fissure in the earth. Thunder resounds up and down the beach as the fusion of the waves nullifies the nearby chop in the water; for an instant there is calm in the surf, until a new pair of waves come to dual. Up the beach, a few guys on surfboards exercised their art of gliding on water. A few others without surfboards tried to lay down on it. A seven-year-old walked balance-beam style on the edge of the lifeguard chair declaring, "Louk ma, oihm ah loifgahd!" Meanwhile, the jellies silently conspired to sting my feet.